Perfect for spring - looking for something fresh & light, delicious & a little different? This it it! This dish is a great way to incorporate all the fresh vegetables of spring. It's roots are Roman as they called it vignarola or vignole but it is found all over Le Marche! A versatile dish that you can make as a primi - pasta dish or as a stew/soup by adding more vegetable stock. Please, please use fresh pasta in this dish - it will make it much softer & worth the effort or cost. We used Spaghetti alla Chitarra a local pasta, but you probably won't find that in the States, so try regular spaghetti, linguini or fettucini. 3/4 cup of vegetable stock (add another 3/4 cup if you are making into a stew) - use the water you will using to blanch the veggies in. 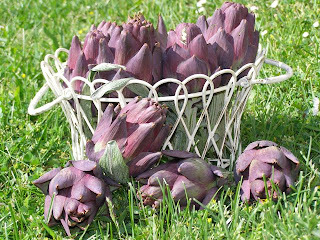 Put artichokes into a pot of cold, salted water & bring to a boil. Boil for about 10 minutes or until tender (you can check by inserting a knife into the heart) and drain. (Tip: Jason puts a plate on top of the boiling water of artichokes so they don't pop out & stay under water!) Allow to cool, then peel off the outer leaves until you find the pale tender ones, remove the choke (fuzzy white parts) using a spoon. Cut the hearts into quarters. Fill the pot with new water, add salt & bring to a boil. 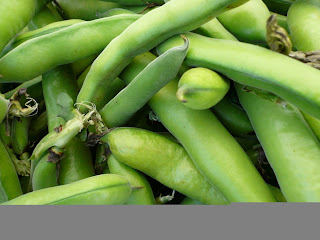 Blanch the fava beans for a minute, remove from water with a slotted spoon. Blanch the leeks for 3 -4 minutes, until tender, and the chard until just wilted. Heat a large saucepan, big enough to hold all the ingredients, and add a good splash of oil. Cook the onion, low & slow for about 10 minutes until soft. Cut the tough parts of the asparagus off the bottom & discard, cut into quarter inch pieces. Sauté for 2-3 minutes with onion. Then add the vegetable stock (the water used to blanch the fava, leeks & chard) and the peas, bring to a boil. Cut the prosciutto into bits & add in - simmer for about 10 minutes, until the peas are cooked and soft and the prosciutto has flavored it all nicely. Chop leeks into strips, run a knife through the chard & stir into the pan. Add the artichoke hearts & fava beans and let simmer for a few minutes. Finish with salt & pepper to taste a small bunch of chopped fresh mint & parsley. Add a few glugs of olive oil. Toss with pasta & drizzle with a bit more olive oil for the bright flavors & colors of spring! Sprinkle with fresh grated parmesan or grana padano.